Sargis Sargsyan (from Yerevan) finished the year ranked 85, with 70 tour points. Sargsyan played in 19 tournaments (14 of the International Series), including a four Grand Slam events (Australia Open, French Open, Wimbledon and US Open). 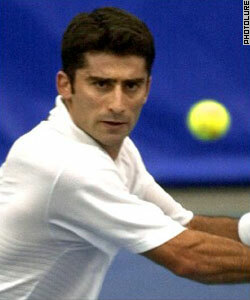 His match record of 13-19 earned Sargsyan about $200,000. David Nalbandian (Argentine-Armenian), finished at No. 12, with 355 points and played in 18 tournaments and was the winner of tournaments in Basel Switzerland and Estoril Portugal. His greatest achievement of the year, however, was reaching the finals of Wimbledon (where he lost to the No. 1 player in the world, Leyton Hewitt). Nalbandyan earned approximately $900,000 for this year. Swiss-Armenian tennis player Marie-Gayane Mikaelyan finished the season in 44th place in the Women's Tennis Association. For the first time this year she played in all four Grand Slam events. Artur Grigoryan from Vanadzor, representing Armenia at the Sambo World Championships in Panama City, Panama took second place in the 57 kilogram weight category in competition finishing December 2. Two other Armenians, Vanik Khojoyan (62 kg) and Shoghik Gevorgyan (48 kg) lost in the first round.